My kids love muddy buddies (aka. monkey munch or whatever you call it at your house). 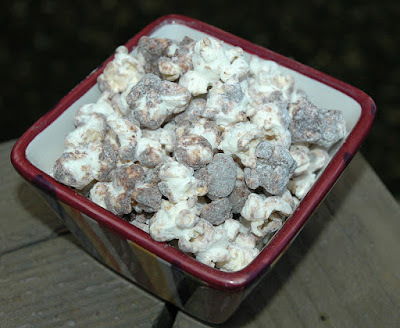 A few years ago we discovered the muddy buddy popcorn version, called Poppy Chow, on Tasty Kitchen. I blogged about it a few years ago, but didn't include the picture or recipe, so I thought I'd give it it's own, new post. In microwave or double boiler, melt chocolate, peanut butter, and butter until melted. Stir in vanilla. Place the popped popcorn in a large bowl and pour the chocolate mixture over all. Stir until evenly coated. Add the powdered sugar and stir until each piece is covered. Spread out on cookie sheets to set the chocolate or refrigerate if you're in a hurry to eat it.